Garden DIY: What the Heck are Mycorrhizal Soil Amendments? We love gardening here at the Hive (and all things DIY), and we love to keep it natural and sustainable. So when I heard about a new way to enhance soil quality and get great results, I had to try it out firsthand. Here’s the scoop: that thing we call “dirt” is actually a complicated mixture of rock and mineral particles, organic matter, and lots and lots of different fungus and bacteria species that work on breaking down the soil components and making them available to plants. There are even some species of fungi that have evolved specially to live in harmony with the roots of certain plants, breaking down the nutrients and helpfully carrying them to the growing root tips where they are easily absorbed. Well, some smart biologists figured out that if you add spores of these fungi directly to soil, it acts as a natural plant booster and even continues to improve the soil year after year. Seeing as though I love gardening and I love the fascinating world of fungi, I couldn’t wait to experiment with my own little patch of dirt. I ordered a one ounce packet of MycoGrow and a jar of Plant Success tabs from Fungi Perfecti, the company founded by mushroom guru Paul Stamets. I figured they must have the good stuff! I used the Plant Success tabs when planting my summer marigolds and small thyme plant shown above. I added a bit of the MycoGrow powder to my peppers and tomatoes. Boy, did things ever take off! I had a banner year for jalapeños (which may have had something to do with the recordbreaking heat), and my little thyme plant got huge. Of course, if I was really being scientific I would have planted some control plants, but I must say I am very happy with the results. I plan on ordering even more of the MycoGrow for next season's vegetables, and I'm looking into other ways to introduce beneficial fungi into my garden soil. 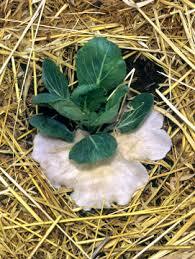 There are even several species of edible mushroom that can be used for companion planting with veggies!